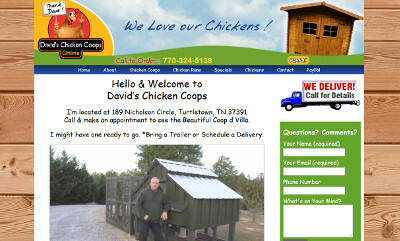 David, the owner of David’s Chicken Coops in Tennessee, contacted us by phone yesterday and was in need of getting some help with his website. He was looking to have a new webmaster completely take over everything for his website needs. We spoke with David in more detail that evening and we got the ball started. He was ready to go with the the backup copies of his website files and the other information we needed to proceed. By the end of the night, we had the website setup and restored on our servers since he wanted us to manage the hosting and SSL certificate as well. Unfortunately his website was very outdated and there were some scripting/programming issues but we pulled through and overcame those issues. Today, we were in contact with David letting him know everything was ready to go and also gave him some additional options. He agreed to have us make the website mobile friendly as well – which we also completed within a few hours. The changes to the domain name are now completed and is pointing to the site on our servers – that is updated and now mobile friendly. Thank you for your business David! David’s Chicken Coops website is at davidschickencoop.com.